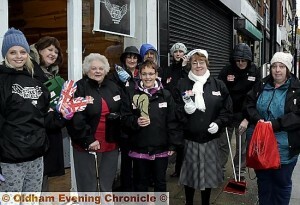 A HOST of heaven-sent angels have been keeping watch and saving the soles of Oldham’s festive revellers. Kind and caring Street Angel volunteers have been pounding the streets and burning the midnight oil to help party people in distress — a hugely successful Oldham Town Centre Chaplaincy project which has brought safety and a sense of calm to the town. But as well as patching up the ill and injured, defusing feuds and providing a shelter for those very much worse for wear, the Street Angels have taken their campaign a step further, handing out flip-flops to girls who no longer have a head for 6in heel heights! Jean says the need is so great the self-funding project is declaring a flip-flop amnesty! She’s appealing to town-centre retailers who have any of the footwear left over from the summer to donate them to the Street Angels. Street Angels — who celebrated their first birthday in November — are now gearing up for the biggest party night of the year, New Year’s Eve. “We will be there out with the revellers, spreading good cheer and helping out where we are needed,” said an undaunted Jean. “The main thing for us is to keep smiling and keep calm. We’re not there to preach, we’re not against drinking we just want people to have a good time safely. Street Angels has become such an invaluable tool in the fight against drink-fuelled disorder and crime, they’ve been hailed heroes by the police and Oldham Council. We’re often called on by the police to help defuse a situation which would otherwise end in someone being arrested. Thanks to local businessman Sajid Ali they now have rent-free premises. Jean said after spending a night on the streets with the volunteers and seeing the work they do he decided he couldn’t charge them a penny for their Yorkshire Street base. But they’re always receptive to offers of funding or supplies, especially first-aid kits. “This year we were asked by the town-centre businesses to provide a presence at Christmas events during the day in the town and that is something we’re looking to do more of next year,” added Jean. If anyone is interested in volunteering, and not just to walk the streets at night, but to help us with all sorts of things either get in touch or call into our base on a Saturday night. We offer tea, coffee and Audrey’s home-made cakes!